Inflammation is caused by infection or overexertion of muscles. As long as there is no fever, the immune system is able to contain the infection locally. The inflammation is often accompanied by pain as well. 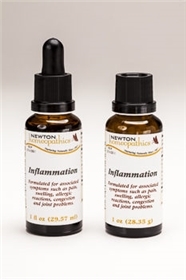 Use Inflammation for relief of swelling and inflammation not accompanied by fever. When there is fever, add the Fever-Infection complex alternated with the Inflammation complex. DIRECTIONS: Take 3 to 6 drops on the tongue every 15 to 60 minutes, depending on the intensity of the symptoms, until inflammation is reduced. INGREDIENTS: Aconitum napellus, Apis mellifica, Arnica montana, Arsenicum album, Baptisiatinctoria, Chelidonium majus, Hepar sulphuris calcareum, Iodium, Lachesis mutus, Phosphorus, Pulsatilla, Pyrogenium, Rhus toxicodendron, Veratrum viride 15x. Anthracinum 12x. Arnica montana, Echinacea purpurea, Gaultheria procumbens, Hydrastis canadensis, Salix alba, Verbascum thapsus 3x. Alcohol 20%.